Warm buttery dinner rolls from scratch in just 60 minutes. 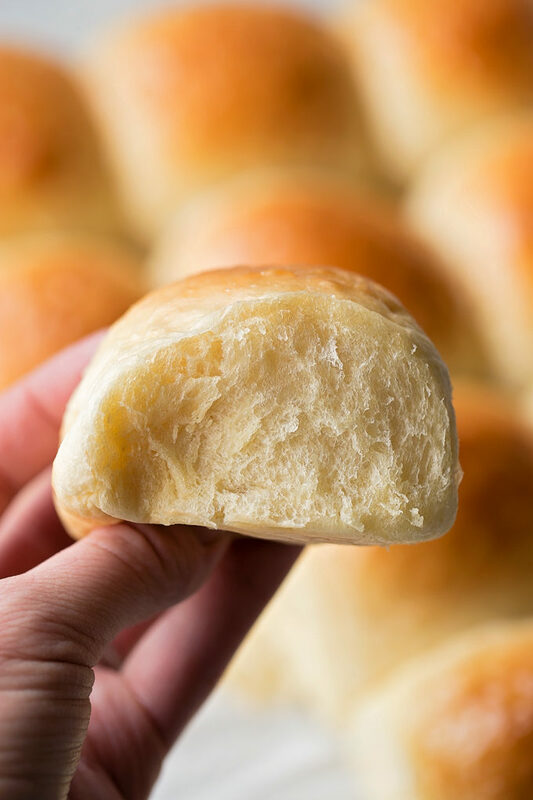 These 1 hour soft & fluffy dinner rolls are so easy to make they’re sure to become a family favorite! Holidays always meant that mom was going to make a big batch of dinner rolls. 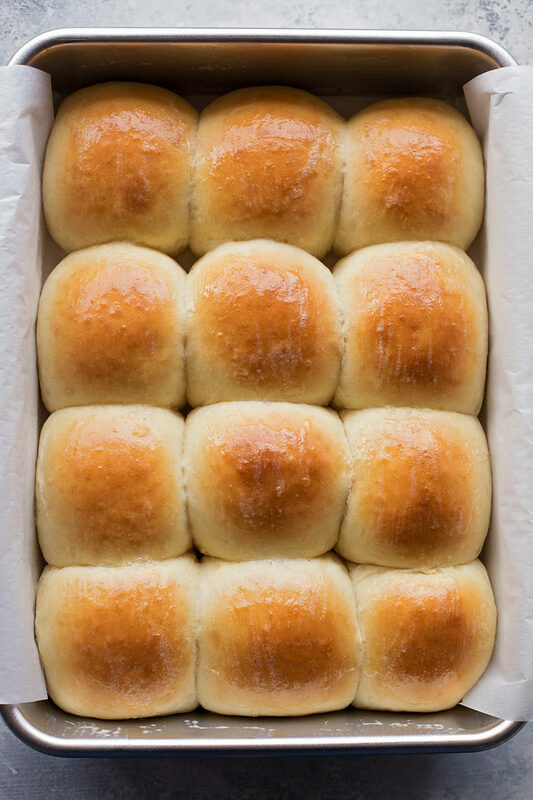 I always looked forward to eating more rolls than anything else… I really loved them! Now that I’ve got a little family of my own, I love to make rolls for special meals like Easter, Thanksgiving and Christmas dinners. Every once in a while I’ll make a batch of these rolls to go with a weeknight meal, but waiting around for rolls to do their thing, just isn’t mine! So I decided to see if I could come up with a recipe for the softest, fluffiest dinner rolls that would only take 1 hour from start to finish. Today I’m sharing them with you! Last week I posted my 1 Hour Cinnamon Rolls here on the blog. The recipe for these 1 Hour Soft & Fluffy Dinner rolls is very similar. 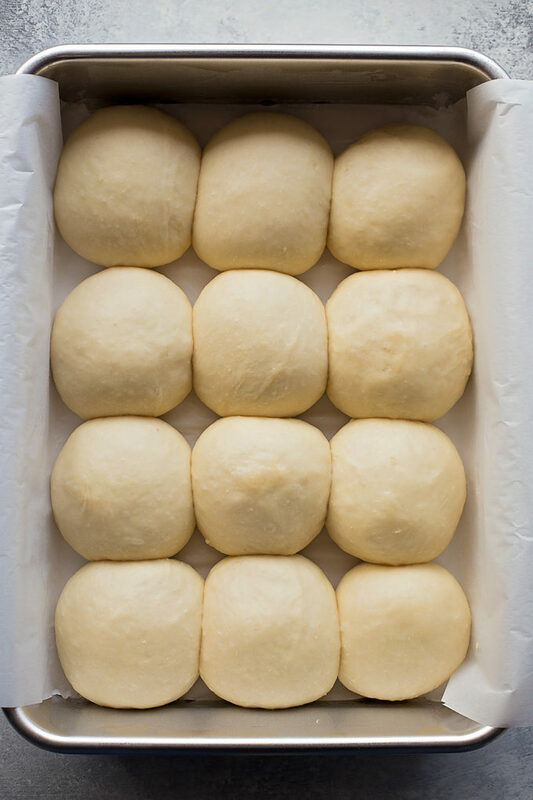 By creating a quick-rise dough, it’s easy to get a batch of rolls made and baked within 60 minutes. A little oven proofing helps these rolls rise in no-time, something I find extremely appealing about this recipe! So let’s get started… the clock is ticking! In a medium size microwave safe bowl or a glass measuring cup, combine the honey, butter, water and milk. Place it in the microwave and heat it until the butter is mostly melted. Whisk the mixture until it all of the butter has completely melted. Allow it to rest on your counter until it reaches 110-115 degrees. We want it to be warm, not hot. While the mixture is cooling, combine the flour, yeast and salt in the bowl of a stand mixer fitted with the paddle attachment (recipe below gives instructions for those who don’t have a mixer). 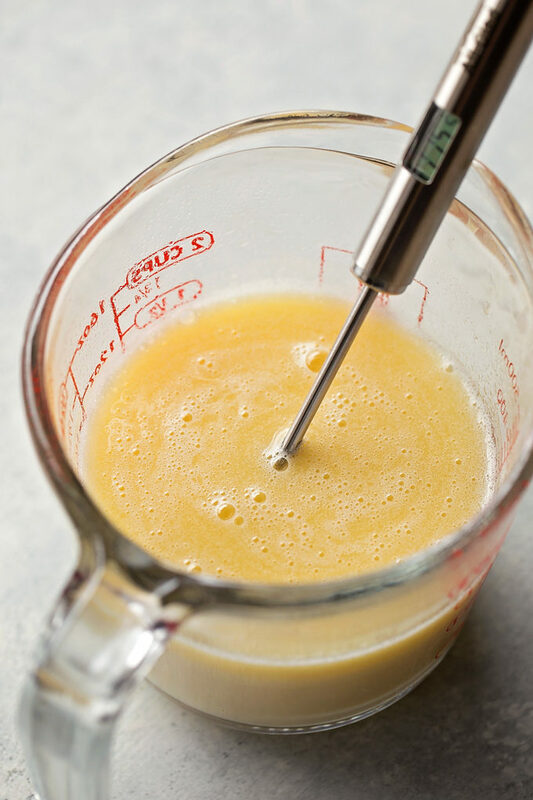 With the mixing speed on low, pour the slightly cooled liquids into the bowl of the stand mixer, then add the egg. Mix until a tacky dough forms. The dough is going to look EXTREMELY sticky. It’s ok to add a sprinkle of flour here and there, but don’t overdo it or your rolls will be hard as a rock. Switch to the dough hook and knead until a nice ball forms, about 5 minutes. Turn your oven on to 200 degrees. Transfer the ball of dough to a lightly floured surface and sprinkle a bit of flour on top. Cover with plastic wrap and allow the dough to rest for 5 minutes. Resting will help the gluten form and will create a lighter fluffier roll. It’s a necessary step! Next, butter a ¼ sheet pan (I prefer using a deep one with tall sides to help the rolls rise up). 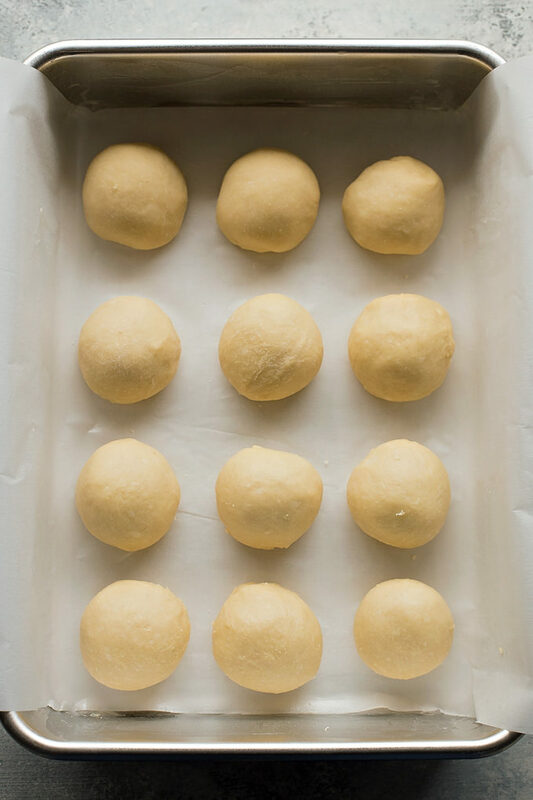 Cut the ball of dough into 12 equal size pieces. I like to do wedges so it looks like a sliced pizza, but any method will work. Roll the pieces into taut balls and place in the prepared pan. Turn OFF your oven and cover the rolls with plastic wrap. Place them in the oven and allow them to rise (proof) for 25 minutes. Once they have doubled in size and the sides are touching, turn your oven ON to 375 degrees and bake them for 15-20 minutes. When you peek in your oven and see that the tops of the rolls are a deep golden brown in color, it’s time to take them out! Slather a nice thick layer of butter on them and let them cool for a few minutes before breaking apart and eating! They go great with just about anything and are even more delicious when covered in whipped honey butter or cinnamon butter! We absolutely LOVED these rolls and will definitely be making them time and time again! These 1 hour soft & fluffy dinner rolls are our new go-to recipe!!! In the bowl of a stand mixer fitted with the paddle attachment, combine the flour, yeast and salt. In a microwave safe bowl (or 2 cup glass measuring cup), combine the honey, butter, water and milk. Heat in the microwave until the mixture is warm and the butter is almost melted (it took about 1 minute on HIGH in my microwave), remove and whisk to ensure the butter melt completely. Allow to sit on the counter until it reaches 110-115 degrees before adding it into the flour mixture. Add the warm milk mixture and egg, mix on low until a soft and sticky dough forms. Switch to the dough hook and and knead on low for 5 minutes or until the dough becomes elastic. Transfer to a lightly floured surface, sprinkle the top with a light dusting of flour and cover with plastic wrap. Allow the dough to rest for 5 minutes. Once the dough has rested, cut it into 12 equal pieces. Roll into circles and place into a well-buttered quarter sheet pan (I like to line mine with parchment paper for easy removal, I butter the parchment and the bare sides of the pan). Cover the pan with plastic wrap. Turn OFF the oven and place the covered rolls inside to rise for 25 minutes. The rolls should have doubled in size and the sides should be touching. Remove the rolls from the oven and turn ON your oven to 375 degrees. Once heated, remove plastic and bake the rolls for 15-20 minutes or until the centers are lightly golden brown in color. Just keep an eye on them, they may take a bit longer. Remove from the oven and brush with the two tablespoons of melted butter. Serve immediately. -If you live in a dry place or have trouble with baked goods drying out quickly, you may want use a kitchen squirt/mister bottle and lightly spray the tops of the rolls before you let them rise and before they go into the oven to bake. I love quick yeast bread recipes. These really good…so soft and fluffy! Excellent! Quick and delicious. I made them two days in a row. Both times they were delectable. My children loved them. Thank you for the recipe. You know I’m a bread lover too, these look amazing! Ok, Natalie – I’m working my way through many of your recipes and having great success! Just made your cinnamon rolls yesterday and my husband and son freaked!! I was shocked how easy it was and yet, they now think I am some sort of super hero… which, come to think of it – I am. Unfortunately, I never get to eat the goodies I bake because I have about 10, 000 food intolerances. Ugh. Anyway, they LOVED them – so I thought I’d try these dinner rolls. Question, however, neither my son nor hubby like the taste of honey… should I use sugar? 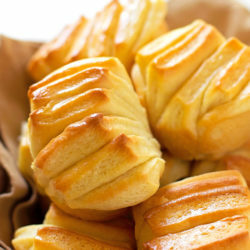 And are these rolls sweet? Both seem to prefer reg. rolls and breads unless they are eating cake or muffins…. can I completely omit the sugar and still have the rolls turn out right? Yay for success! I love to hear that 🙂 I think that granulated sugar would be a great substitute for the honey. The rolls are not sweet at all, I just like using honey when I can, especially because we have a ton of it! Oh, and I think a little sugar is necessary to all yeast recipes, but you could definitely try reducing it a bit and see how it works. I was wondering how important it is that the milk is whole milk. We use 1%. Would evaporated milk be better? Hi Rachelle! Yes, rapid rise yeast- I will make sure to note that in the instructions! They did not rise for me either! The dough was so sticky it could not be formed! In the 30 years I habe been a pastry chef and baker, I have not had a bread turn out. Waste of time and money yo make these! A had to add about an extra couple of flour or more to make them not so sticky. I think it depends on where you are baking them. I live in the south but I’m from Alaska and I know ingredients can need adjusting based on your climate. Very soft and fluffy, a bit dense.. these are some filling rolls with some weight to them. The rolls only took 13mins, I know it varies by oven and altitude so I live in Texas if that helps anyone. Definitely add the honey! I’ve tried other rolls and they were missing something, it was the honey. I’m eating one as I write this. They are good warmed up the morning after with some jam. Thanks for your feedback Hannah! I would say if you have time let them rise for 10 or 15 minutes more and they will probably be a bit fluffier. Glad you enjoyed them! do you follow the direction’s re: the yeast on the jar or just put the yeast directly into the flower ? Because it’s quick or instant yeast, you will put it directly into the flour. with yeast, do you put directly into the flower ,or follow the directions on the yeast jar, by adding water & sugar & let stand for five min. Hi Nathalie, I love soft and fluffy bread rolls… And these look really yummy! Can’t wait it try out your recipe. However, I don’t have a microwave… Can I do step 2 directly on the stove? Do I melt the butter, honey , milk and water directly in a pot or in a bowl over simmering water? Thanks very much! Made these tonight for dinner. I was so pleasantly surprised! I didn’t expect them to be so fluffy and soft without hours of rising. They took a little over an hour to make and I left them to “proof” in the oven an extra 15 minutes to make them rise more. Wow! I will make these regularly! And for those wondering about honey, you can’t taste honey in them. They are delicious! Go with dinner as well as a dessert with some Nutella spread on them 🙂 THANK YOU! Yum, Nutella sounds amazing! Thanks Paulina! Can you substitute wheat flour to make wheat rolls? Can I freeze the dough? What would I do then? Thaw out, let rise again, add something? Also if u can freeze dough, can I split recipe and only bake half the dough? It’s just the hubby and I and he loves fresh rolls right out if the oven but obviously 12 rolls is way too much for 2 people. Hmmm… I would probably say you could just roll them, cut them and freeze them individually if you wanted to. Then just let them rise as your oven heats up. Pop them in (as many as you want to do at a time) and see how they turn out. I’ve never tried doing this before, so please let me know if it works!!! I’m new to baking rolls and bread tried these and mine seemed to be quite dense. Please help me as to what I did wrong. Hi Diane, you can just mix everything in a bowl and then knead it by hand… probably a 2-3 minutes more than the recipe calls for. Hope that helps! 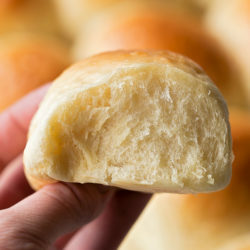 I’ve been searching for a great roll recipe and this seems easy enough and they look yummy! However I was just wondering if it’ll make a difference if I use unbleached bread flour? Also…I live in colorado and I’m sure I’ll need to use the water tip you gave. How much water do you use? And I keep the water in there even when they are cooking? It would probably be just fine! 1. Can I double the recipe? 2. Can I make 24 rolls instead of 12 to make them a bit smaller or would they be two small? Yes & yes! Although with a double batch you may have to let it rise a bit longer. I tried these, and they didn’t turn out anywhere like yours. I used the bread machine yeast. Could this be the reason why! 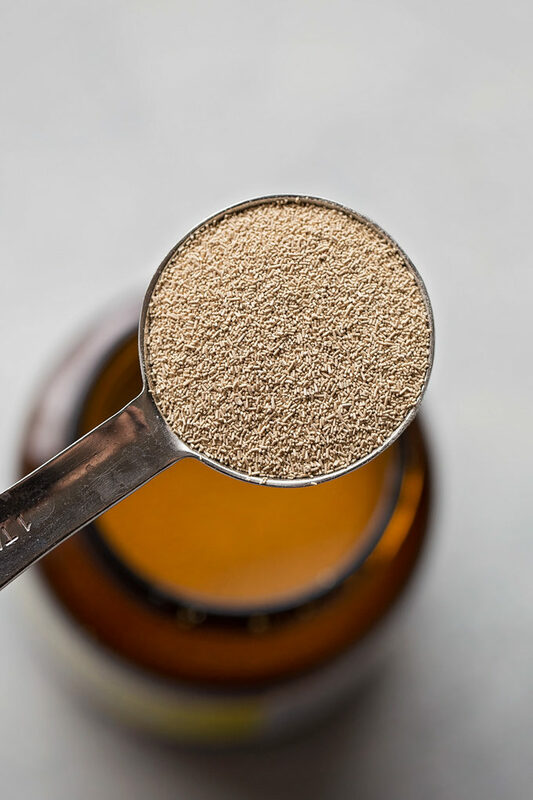 Is active dry yeast same as instant yeast? They are actually two different types of yeast. Instant does not need to be proofed and active does. Have made these SEVERAL times and absolutely love them! One question though, If replacing the honey with sugar, how much do you use? The same amount as honey or different amount? these are such a win! 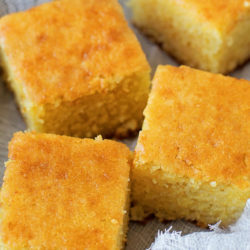 i made them for the second time last night and they were incredible — so fluffy and amazing, never would have guessed that they were a “quick” recipe 🙂 definitely a keeper!!! No words! But I’ll use: amazing, weekly, perfect, delectable, soft, fluffy… Thanks!! That sounds amazing! I love anything in cast iron, and open flame add flavor. Thanks for the tip! Can I put filling in this recipe? Can you make these overnight and cook in the a.m.? Yes! Just cover them with plastic wrap after shaping them and then let them rise like you would, although they make take a little longer to double in size. I made these tonight abd the bottoms burned 🙁 the oven wad set to 375 and i used dark pans. Smelt then burning at about 12 minutes in. Next time should i use light pans? Oh no! I’ve never had an issue with the bottoms getting too dark. I’d either use a lighter pan (I don’t own any dark ones) or line it with parchment paper just to be safe! Homemade recipe are the best! These looks great! I want to make these for Thanksgiving but I’m not sure how to manage the proofing in the oven with my bird in the oven all day. Can I proof these at a (warm) room temp? How long would I need to do that for? Can I use my bread machine to make the dough. I have a hard time mixing by hand. Hello Natalie…I made these for the first time me and my husband, Didn’t turn out how ours did but they were good, Question I have a Kitchen Aid mixer do I use the the dough hook through the entire thing or do I mix it up. You mix them with the paddle attachment first, then the dough hook. If you’re worried about the rise, make sure your liquids are the proper temperature before adding them to the flour/yeast mixture, and, give them a little extra time to rest & rise (add 10 minutes to the rest time and 15 minutes to the rise time). I know that puts them over an hour, but some people live at different altitudes or have different levels of humidity in their kitchens and those are two factors that change how bread develops. Wonderful dinner rolls. We truly enjoyed and this recipe was super easy. thanks for sharing. I want to mk these rolls! My mouth is watering just reading the recipe! Lol I have a question: once the rolls rise, u said turn the oven bk on and bake. Do I take the rolls out n order to preheat the oven, put them bk n once preheated and bake? Yes, you’ll want to take them out while it’s preheating. I had that same question. Thanks for asking. Also, even though it’s common sense, the recipe doesn’t state to remove the plastic wrap before baking. I know it needs to be, but might be a good idea to clarify especially for someone who’s a beginner. I look forward to trying these out today. For the first time I was able to make awesome rolls…thank you for sharing! My first attempt at making any sort of bread or rolls. The dough was very sticky so I used more flour than stated, but they turned out great despite some awkward moves on my part. Wonderful with sweet butter and homemade jam. I did struggle with dividing the dough so the rolls were proportional, but I figure that’s about practice more than anything. Making these again tomorrow night for my son and his wife who are just home with their new baby. Thanks so much for a recipe that I could succeed with. 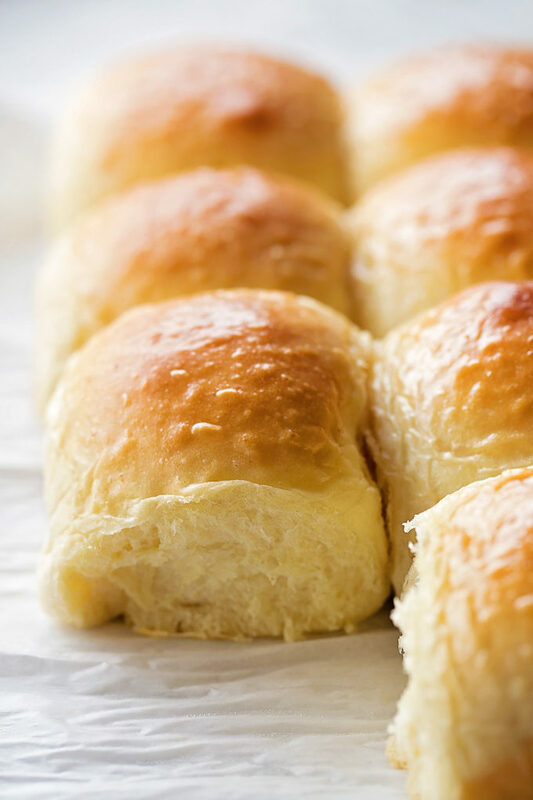 I love how fast and easy these rolls are unfortunately they do not raise enough and therefore become a sweet scone like treat and not a light and fluffy roll. Should I let it rise a bit longer before putting it in the oven to double in size or is there something else I might be doing wrong? I have done them 4 times now tweaking slightly but they always turn out the same. I am SO glad I tried this recipe tonight. I did not change one thing. Followed it exactly as written. I DID have some doubts about the dough looking so sticky in the mixer. But did not add more flour. I let the dough hook knead it for the time apecified. It changed to being less sticky but still wasn’t a dry dough. I used a rubber spatula to scrape it out onto the lightly floured counter and just lightly sprinkled the top with a bit of flour. I very gently folded that in just enough so that it wasn’t sticky but still pretty soft. Proofed it and baked exactly as written. Checking at 25 min but it needed 5 min more. They were perfectly browned on top and bottom. They did have a bit more weight to them so I thought they’d be too dense, but they weren’t. They’re wonderful. Especially considering they’re done in an hour. I will definitely make these again. Many mire times I’m sure! Thank you so much! I’ll share my pictures of them if I can figure out how. Natalie: I am preparing for a yeast bread class that I am teaching. May I share your recipe for these quick dinner rolls with my class? 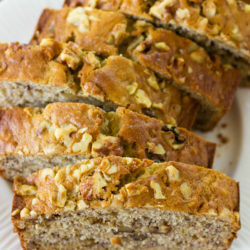 Thank you so much for posting your directions and development of making this recipe. I am certain many of the ladies that I will be teaching will enjoy learning that they can make dinner rolls in about an hour. This is the first time I have ever made rolls. Now I’ve made bread before so I knew some things like don’t overwork the dough and how to make them look pretty by rolling sides under and leaving a ball on top. I must say, this is a hands down, super easy, and very delicious roll! My boyfriend and I are in awe of these! Everything is dead on, taste, fluffy, color! Thank you for this recipe! I’m not even gonna look for another one. THIS IS THE ONE!